Before becoming an amp builder, Fx was a musician, and vintage amp lover. After having his wonderful daughter, he moved to low power amplifiers, but offer was scarce then. He decided to build it’s first low power amplifier, called the Lableue. Succes was immediate, and Fxamps was born. It was 8 years ago. Fxamps then quickly became a brand synonym of quality and sound. We since built hundreds of amplifiers, launched various models, and more importantly, we kept improving every aspect of our amplifiers : sound, quality, design. When you choose an Fx amplifier, you choose an amplifier that you’ll play and love for life. All FxAmps amplifiers are perfectly wired, with the greatest possible care, and the best wire available. This is how we ensure a totally clean sound, with no buzz, hum or hiss, and a virtually unlimited lifetime. We only use superior components, selected, from the best manufacturers available (Sozo, Jupiter, F+T, …). 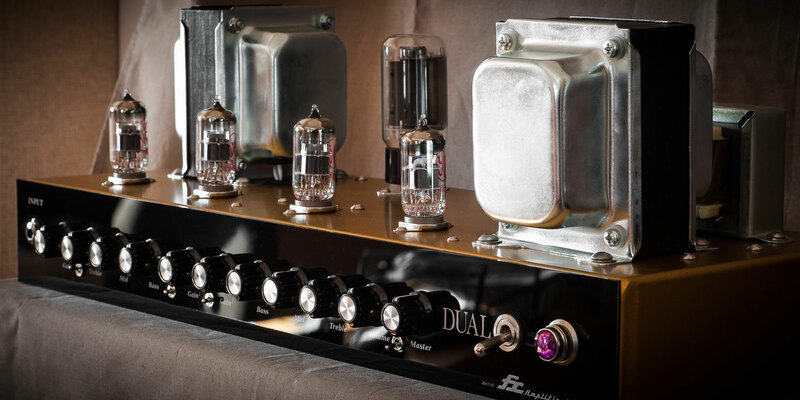 Just like the electric circuits, the mechanical parts of our amps are treated with extreme care. All Fxamps amplifiers use renowned brand parts, made in Europe or USA, to ensure the best longevity to your amp. Everything is finely assembled following strict procedure, with stainless steel screws, and strong, thick aluminium chassis.